A few years ago I helped write a paper where we proposed scraping p-values from the medical literature to try to estimate the science-wise false discovery rate. The paper generated a ton of interesting discussion and inspired other groups to start collecting p-values from the literature. As I’ve mentioned before the p-value is the most popular statistic ever invented so there are a lot of published p-values out there. jager2014 - This data set comes from the paper: An estimate of the science-wise false discovery rate and application to the top medical literature that first proposed p-value scraping from the medical literature for re-analysis. brodeur2016 - This data set comes from the paper Star Wars: The empirics strike back which collected p-values from the economics literature. head2015 - This data set comes from the paper The Extent and Consequences of P-Hacking in Science and is an extension of the jager2014 idea to a much larger collection of biological papers. chavalarias2016 - This data set comes from the paper Evolution of Reporting P Values in the Biomedical Literature, 1990-2015 and is an extension of the jager2014 idea to a much larger collection of medical papers. allp - merges the head2015, chavalarias2016, and brodeur2016 while removing duplicates. To see how it is created view the merging vignette. field - The field of the paper, using the categorization in Head et al. 2015.
operator - Whether the p-value was reported as “lessthan”, “greaterthan”, or “equals”. doi - When available the digital object identifier. Then you can load the library and then access each data set by name. Data sets can be easily merged, but be careful to avoid duplicated p-values across different data sets. You can see how each data set was obtained and tidied by viewing the corresponding vignette. One purpose of tidying these data is to be able to do cross-study analysis of p-values in the literature. 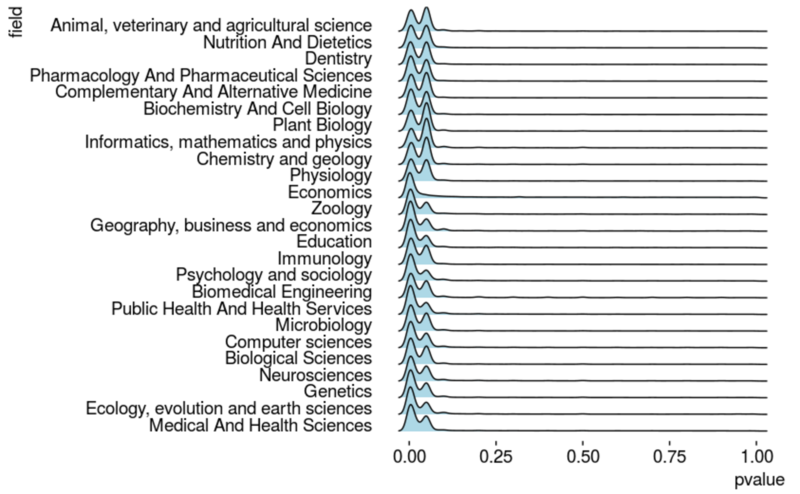 As a teaser for things coming soon, this plot represents more than 2.5 million p-values across 25 different fields. Notice anything funny?